Long cruising range, adaptability and fine performance make this one of the most popular new planes. ONE thing can be said for the Swift right from the start—it’s a corking good airplane and offers the guy who wants to fly a lot more value than its price of $3,495.00 indicates. It’s all-metal, one of the first samples of production-line technique applied to the aircraft industry. Moreover, it’s “clean” and has that “big-plane” feel we all like so much. The original job, NX 17640, had a wood wing, dural monocoque fuselage and fabric covered control surfaces. 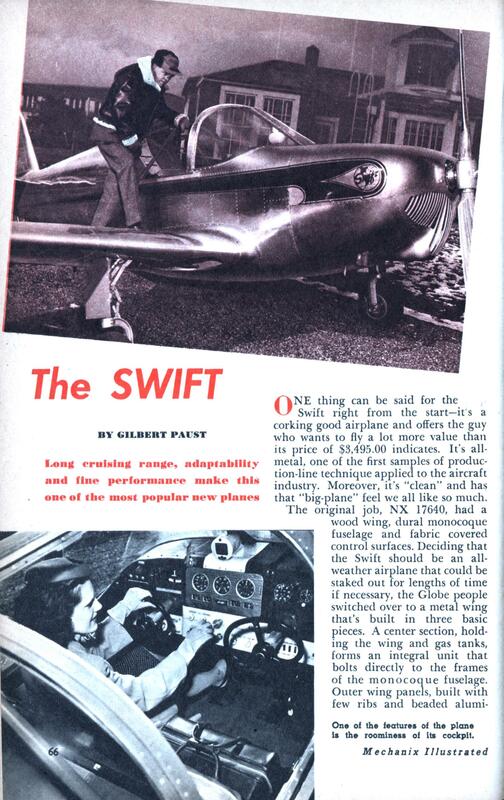 Deciding that the Swift should be an all-weather airplane that could be staked out for lengths of time if necessary, the Globe people switched over to a metal wing that’s built in three basic pieces. A center section, holding the wing and gas tanks, forms an integral unit that bolts directly to the frames of the monocoque fuselage. Outer wing panels, built with few ribs and beaded alumi- num alloy skins or covers to stiffen the structure are attached just outboard of the landing gear and flaps. Removable wing tips and slot sections make for simple repair, at less cost than if these units weren’t easily detachable. Repair and servicing are an important phase of the aircraft business that many of the manufacturers are overlooking or leaving pretty much to chance, but not the Globe Aircraft Corporation. Their advertising slogan that “You’re never more than Swift flying range from an authorized Swift Service Center” is a comforting thought in purchasing a plane. It’s a simple, proven basis that the auto manufacturers used to build their businesses on, and more of that would instill a good deal of confidence in the flying public. The plane itself is one that will appeal to most everyone—low wing basic design that has rather racy lines, a “convertible” top, and a wide range of vision make it a ship that will appeal to the sportsman pilot and business-man alike. For flying in business clothes, the sliding sections of the cabin hatch can be closed completely, but for sport flying the side panels can be left open or the side panels up with the top open. Speaking again of experimentation, Globe engineers went through a complete investigation of the degree of sensitivity necessary in the controls before producing the final design. The plane doesn’t have to be “flown every minute of the time,” nor are the controls sloppy. To the contrary, quick response to the controls is one of the features of Globe Swift. Globe has had the interior of the Swift styled— and the results are another indication that we’re past the “stick and bailing wire days.” Blue and cream colors are standard for the interior and these colors have been carried over to the instrument panel. In a cream plastic setting is a “packaged unit” of instruments between the two control wheel. Airspeed, Tachometer and Altimeter across the top, with Fuel Pressure, Oil Pressure and Temperature Gauges and an Ammeter across the bottom create a feeling of ease in handling the airplane. Colored lights indicate position of electric-hydraulic landing gear and flaps. A red light means the gear or flaps are up, green shows when they’re down and an amber light burns when the electric pump is operating for the hydraulic pressure. A switch on the instrument panel is all that needs the pilot’s effort to move these units—and another feature helps him remember where he left the landing gear. The red, “up” jewel light flashes if the gear is up and the throttle is retarded. Though performance has been left till late in this report, it’s nothing to be taken lightly. The 85 horsepower Continental in the Swift pulls it along at 135 mph., making a 125 mph. cruising speed comfortably without straining the engine. The ship lands at slightly less than 50 mph. loaded up to its normal gross weight of 1,570 pounds and with the flaps full down. Service ceiling is 14,500 feet—enough to clear almost anything in the way of hills on our continent. 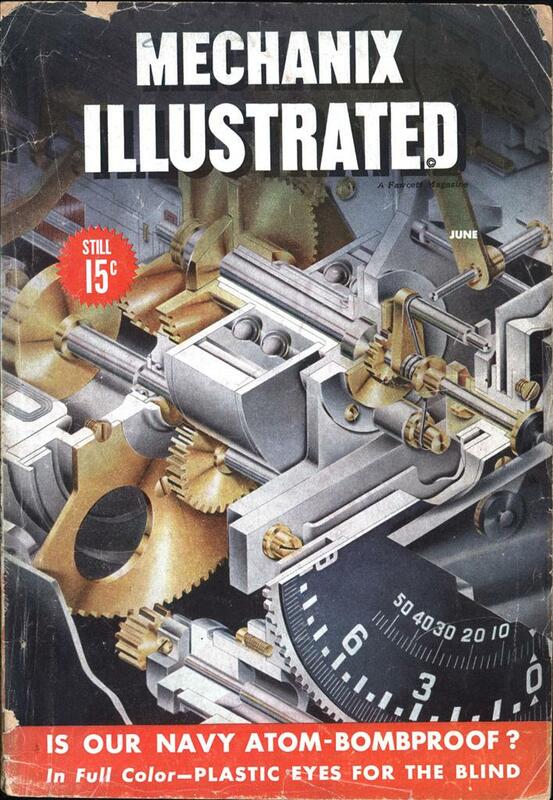 Two fifteen gallon tanks, interconnected through a single sump at the center of the plane create two features worth noting. Thirty gallons of gas give this ship a range of 700 miles—two hundred more than other two-place ships boast—and the single sump and cross-venting make it possible to fill both tanks from a single cap in the left wing. This plane could be honestly termed a “complete airplane,” without hesitancy. Map cases in the side walls, provision for two-way radio (the new instrument-panel types), a glove compartment on the dash in addition to radio space, and provision for mounting blind flying instruments make this plane capable of any type of service demanded of it. A controllable pitch prop can be mounted if desired. That’s a nice looking plane but in 1946 with the government selling P-51s for $9.99 a dozen I wonder how well it actually did? There are still lots of Swifts around. I saw one at a fly-in breakfast at St. Mary’s PA a few months ago. They’re easy to spot, as the grille in the cowling gives them all a happy grin. I don’t know if it’s still around, but there was a Swift aerobatic team at one point flying four or five of them. I saw them in Elmira maybe ten years ago. @ Mike Brown – Really, thanks for the info. Oh, I was going to mention the grill, very unique, and it does make them look like they’re grinning.